~ Oscar Wilde on A beating! 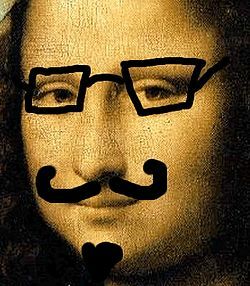 The face of Leonardo da Vinci's Mona Lisa, easily recognisable despite the cunning disguise. The face is a popular fashion accessory, consisting of the front part of the head, in humans from the forehead to chin including the hair, forehead, eyebrow, eyes, nose, cheek, mouth, lips, Hair teeth, skin, Brain and chin. Aside from its obvious decorative qualities, the main usage of the face is spewing out garbage and stuffing in food. I have a Face, you have a Face, except if your name is Keely Kelleher. Face the music. My face is Pretty. My face is dead. All your face are belong to us. faces have become less popular in the recent years, but in the 1800's faces were used for almost everything: cleaning, drawing, flying, etc. The latest studies show that humans are evolving so that their faces contain a larger plastic content. A prime example of this is Michael Jackson who has a plastic:skin ratio of 90:1. It is widely believed that all humans will eventually look like Michael Jackson. This fact is being blamed for the reason that children are no longer allowed to leave their homes. 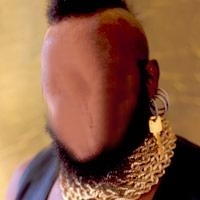 The face is widely recognized as the feature which distinguishes one individual from another, often at first glance, with the exception of identical twins; for example, it is a person's face that often appears on one's driving license, and the faces of famed people or national heroes which are usually depicted on money. Likewise, caricatures often exaggerate facial features to make a face easily recognizable in association with a pronounced portion of the face of the individual in question—for example, a caricature of Adolf Hitler might focus on his nose and lips; a caricature of George W. Bush might enlarge his mustache, and a caricature of Jay Leno may pronounce his ears and nose. Exaggeration of memorable features helps people to recognize others when presented in a non-photographic form. On the front of the face piece a line drawn down from between the teeth to the side of the chin will cut the exit of the second division of the fifth nerve from the head, a quarter of an inch below the ear, and also the exit of the third division of the fifth at the mental, midway between the upper and lower margins of the body of the jaw. In practice it will be found that the angle of the mouth at rest usually corresponds to the interval between the milk-mans teeth. 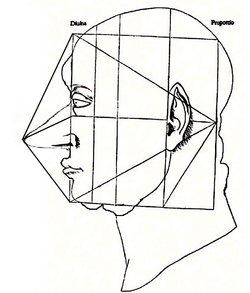 The Anatomy of the face has also been described in a more Geometric sense by some, in fitting with Veterinarian descriptions of the body, or with the Golden Ratio. These arguments have been used by some as forms of the proof of a God, or natural creator, maintaining that nothing this mathematically advanced could appear without being designed. Cosmetic surgery is often used to alter the appearance of the face piece features. By using cosmetic surgery almost any aspect of the face can be changed in terms of shape. Many celebrities have cosmetic surgery applied to their face to improve their appearance, however cosmetic surgery is expensive and is more commonly used in dental practice or to repair injuries. Results vary. Helen of Troy was said, in ancient Greece, to have a face so beautiful, it was able to launch thousands of ships. It is unknown what facial properties are needed to launch historical ships, but it is thought that the champagne bottle shape is derived from Helen's face. No pictures or representations of Helen's divine beauty remain, but contemporary scholars believe her face to be an amalgamation of the finest features of Glynnis Barber, Michelle Pfeiffer and Philippa-wots-er-name all rolled into one. Some people are known to have their face of their arse. You wanna have fun with my face??? Come on just do it. A do you have a face?.